OK, this is NOT an RV vacation trip. 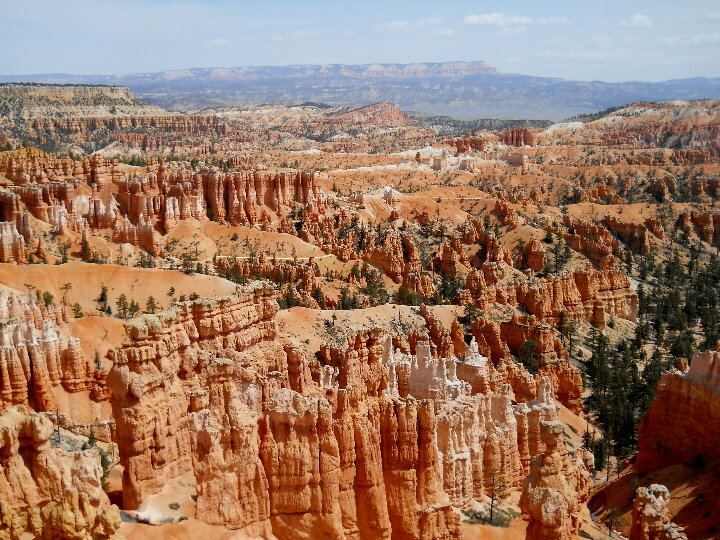 We decided to take a 1-week vacation in Southern Utah (Hoover Dam, Zion National Park, Bryce Canyon National Park, Capital Reef National Park & Kodachrome Basin State Park), which is too far away and too short a time to do in the RV. We set this trip up in January, to use up Lawson's Continental Airlines (now United) frequent flyer miles before they decide to expire them. We flew into Las Vegas and rented a car. We found that it was a lot cheaper to fly into Las Vegas than Salt Lake City. We spent one night in Henderson, NV and after touring Hoover Dam the next day, we drove to Springdale, UT. 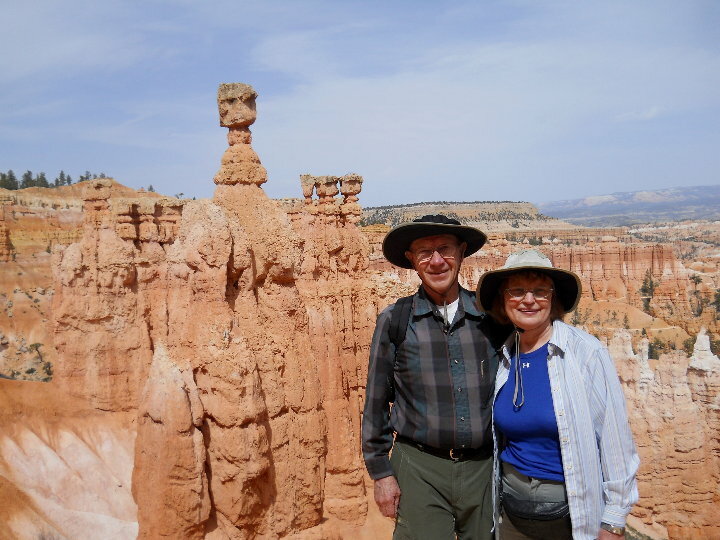 We spent 3 nights in Springdale at Harvest House B&B and 3 nights in Escalante at Canyons B&B. Both were excellent choices and we really enjoyed the stays. The innkeepers and other guests we met were a great asset for helping us plan our daily activities. The weather in the first week of April was a little on the borderline between Spring and Winter. We got a taste of both on the trip. The country is so awesome that photos can't capture the full spectrum. We had a great time. During the interval between our making reservations and taking this trip, Kay's 101 year-old mother, Gracie Fern Houston, passed from this earth into her eternal home in Heaven. Even though we were quite busy taking care of some related responsibilities, we went ahead and made the trip. We were not sorry we did. We hope you enjoy our brief story and selected photos from about 600 we took. 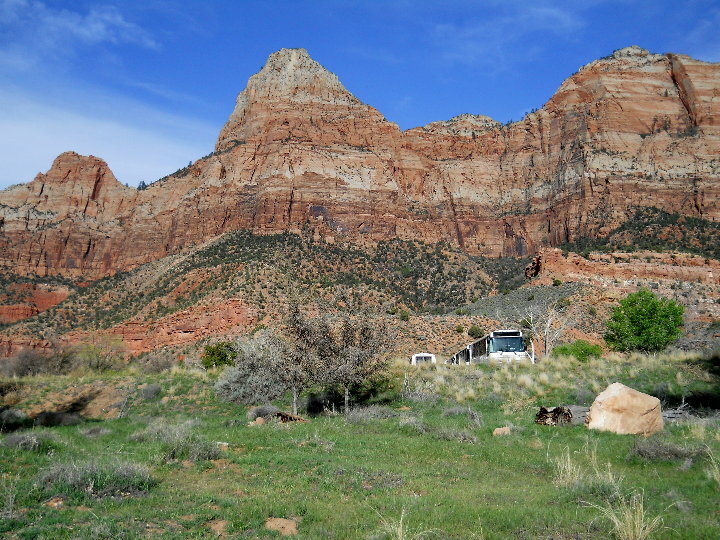 We look forward to some day in the future to take our RV into this area of the country. [Wednesday] We departed from Houston Intercontinental Airport on United #394 at 1:30 PM, after eating lunch in the airport at Panda Express. 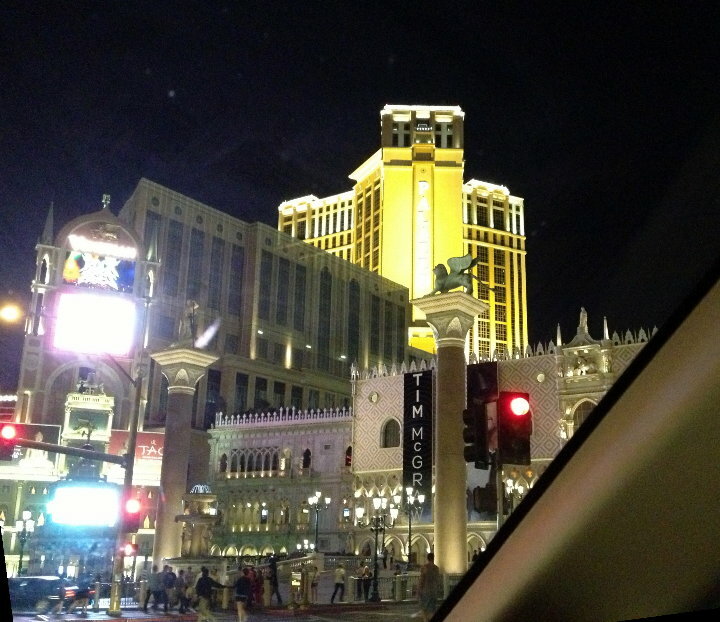 We arrived at Las Vegas at about 2 pm PST and picked up our Budget rental car, a Kia Rio. 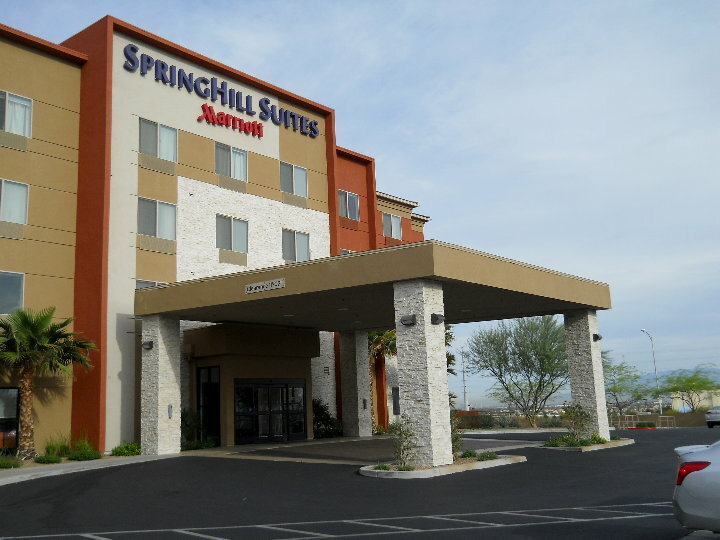 We drove to Springhill Suites hotel and checked in. We went to Walmart and bought some essentials, since we only used carry-on bags on the airplane, so were limited on what we were allowed to bring. 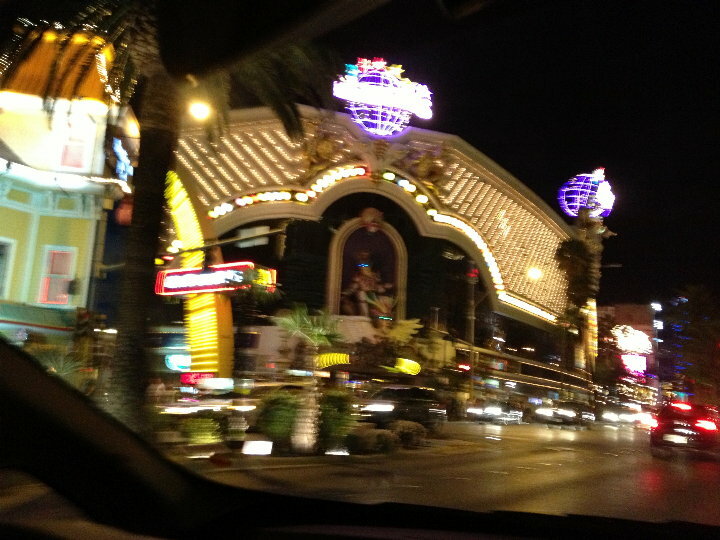 We ate supper at Burger King and drove to downtown Las Vegas and up and down the Strip to see all the lights. What a crazy place! People were everywhere on the sidewalks. We drove back to the hotel and prepared for our week. < Our hotel in Henderson, NV. < < A drive down the Las Vegas Strip. [Thursday] After a good breakfast at the hotel, we drove to Boulder, NV and stopped at the Nevada Visitor Center to get info on Hoover Dam. 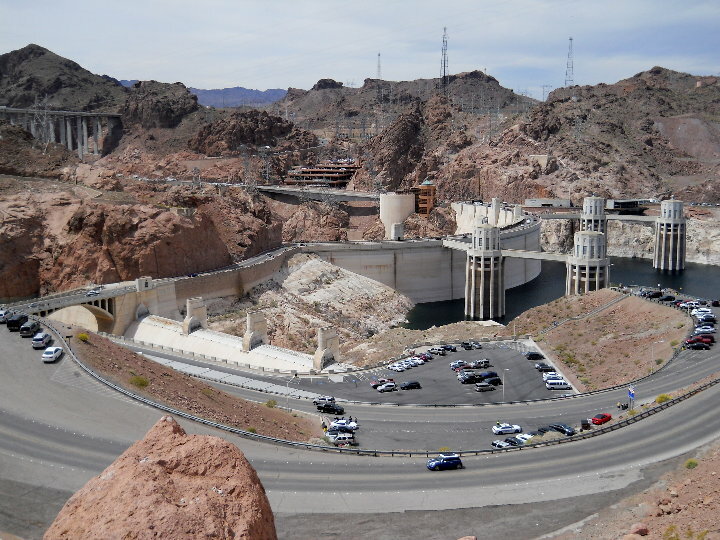 We then drove the short distance to the dam and walked to the new highway bridge across the Colorado River and that overlooked the down-river side of Hoover Dam. Afterwards, we parked in the garage and took the guided Power Plant tour which takes you into the area where the giant turbines generate the electricity. Afterwards we walked around outside, went through the museum and saw a narrative of the complete Colorado River system and drove across the top of the dam to an observation area overlooking the lakeside of the dam. 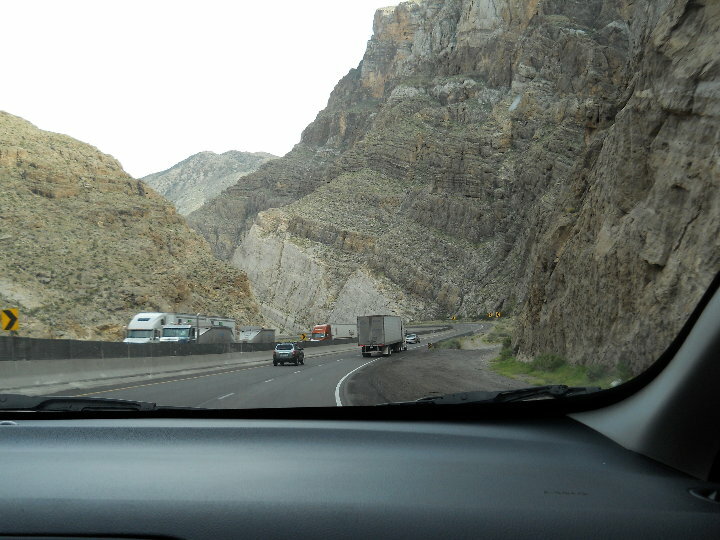 As we left, we drove along the Lake Mead shoreline on Lakeshore Drive, Northshore Road and NV-169 all the way north to I-15, after eating a late lunch in Overton. 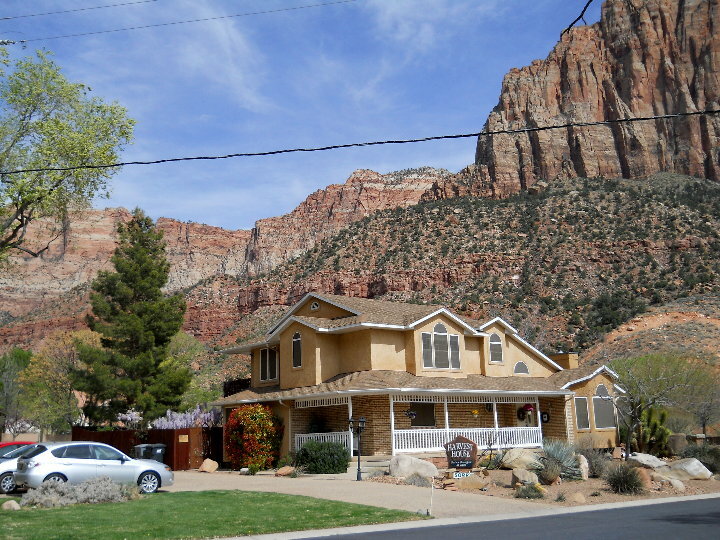 At I-15 we drove to St. George, UT, where we took UT-9 to Springdale, where we checked into Harvest House B&B. The drive from Hoover Dam to Springdale was OUT OF THIS WORLD!!!! 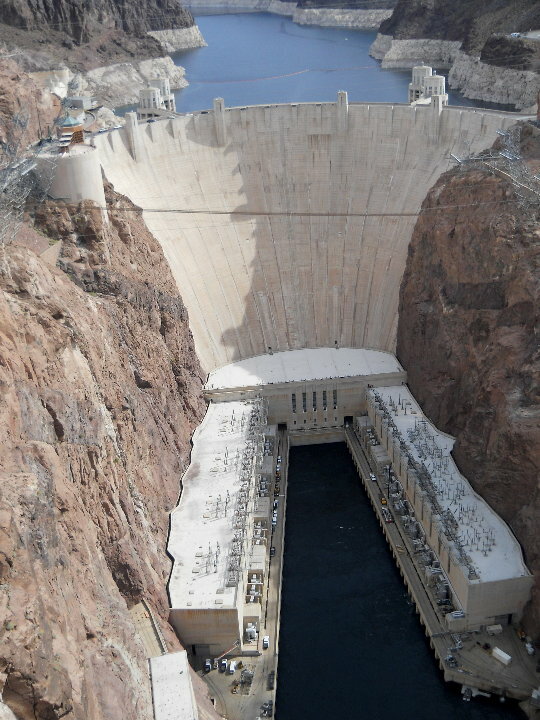 < < Hoover Dam. 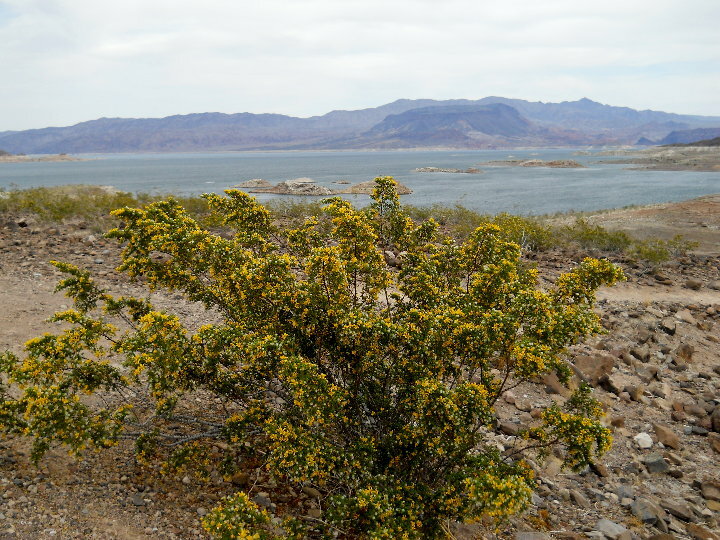 < Lake Mead from Lakeshore Drive. < On I-15 through Arizona. < On UT-9 west of Springdale. 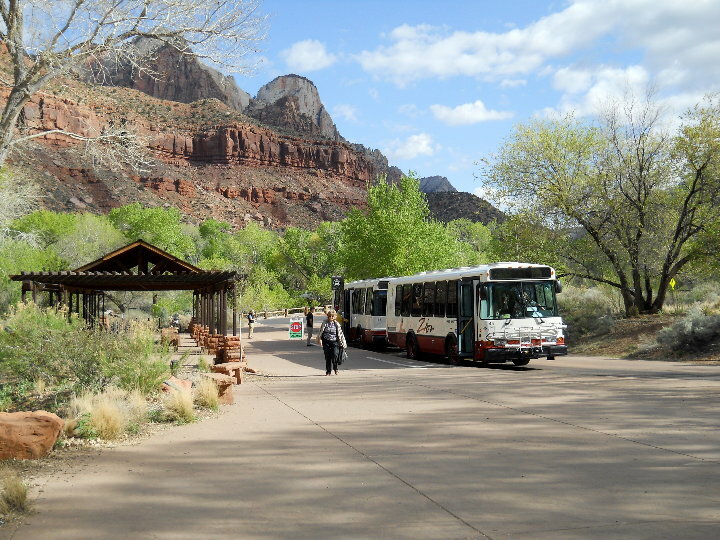 [Friday] After a hearty breakfast and interesting conversations with the 3 other couples in the B&B, we rode the Springdale Zion Park Shuttle bus to the park entrance. Since we had the Golden Pass, it didn't cost us to enter. At the visitor center we picked up a brochure and saw a movie on the park. We then caught the inside park shuttle bus to The Lodge. We walked the Emerald Pools trail to all 3 pools. We arrived back at the Lodge and ate lunch around 2 PM. 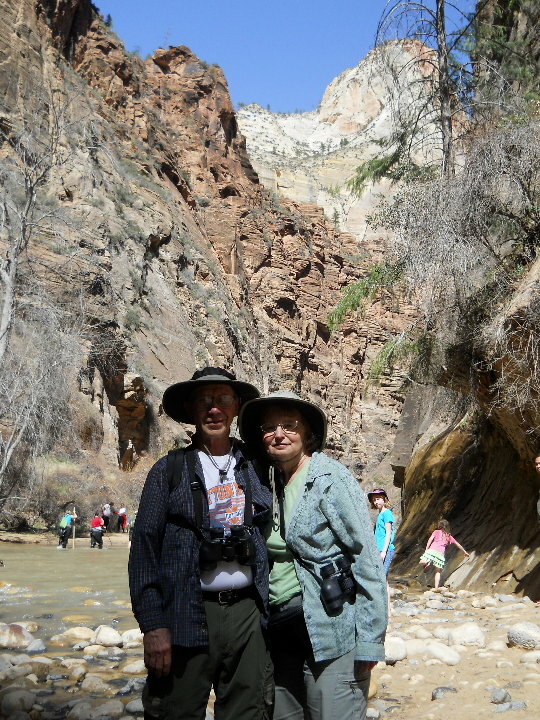 After lunch, we rode the shuttle bus to the last stop on the scenic drive and hiked the Riverside Walk Trail all the way to where the Narrows begins. Afterwards, we came back to the lodge and ate ice cream cones. We then walked the Archeology trail and the Parus Trail. We caught the shuttles back to Springdale and ate snacks for supper at the B&B, and visited with guests Chris & Susan from Manchester, England for a while before bed. < Harvest House Bed & Breakfast. 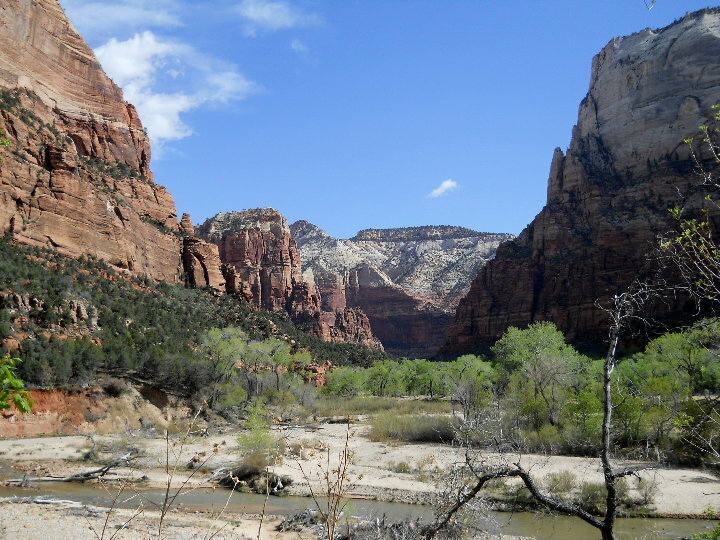 < < < < < < Zion National Park. 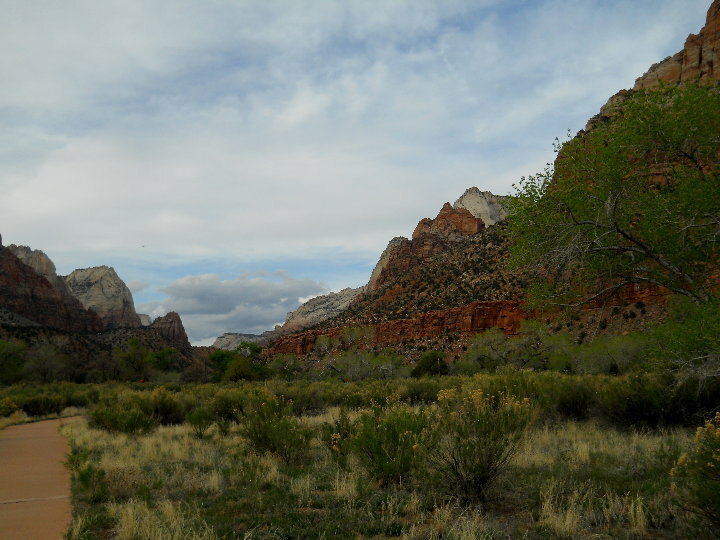 [Saturday] In the morning after another hearty breakfast and nice visits with the 3 couples, we took Tom's (innkeeper) advise and drove 12 miles west of Springdale to Virgin and took the Kolob Terrace Road north to Kolob Reservoir. We saw lots of snow and spectacular views. We ate lunch at Lava Point and came back to Springdale. Afterwards we rode the shuttle to the park and hiked the Emerald Trail to the Keyento Trail which ends at the Grotto. We rode the shuttles back to Springdale and ate dinner at the old gas station converted to a Mexican restaurant. Then back to the B&B, for hot tea and some conversation. 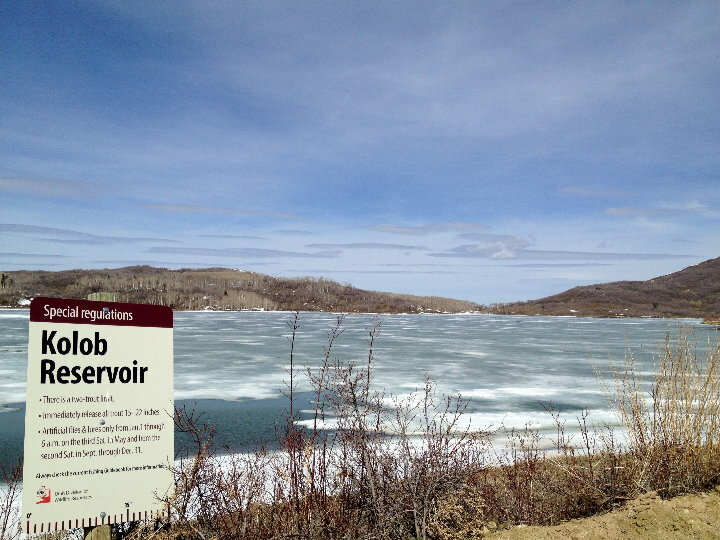 < Frozen Kolob Reservoir. 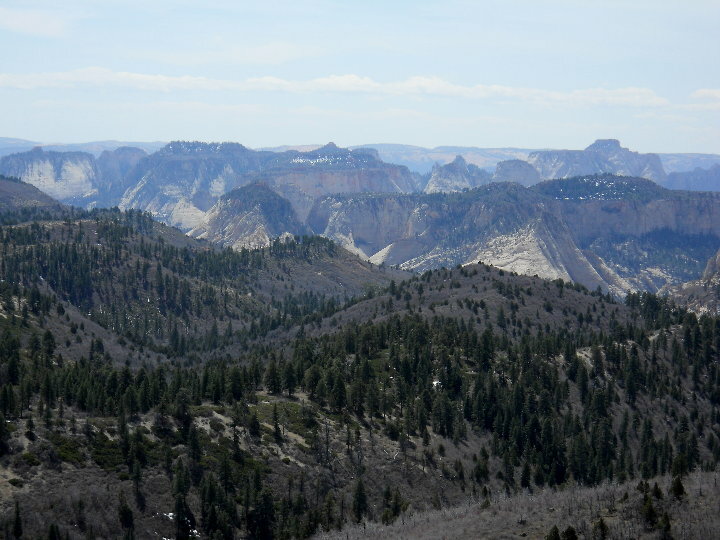 < Distant view of Zion National Park from Lava Point. 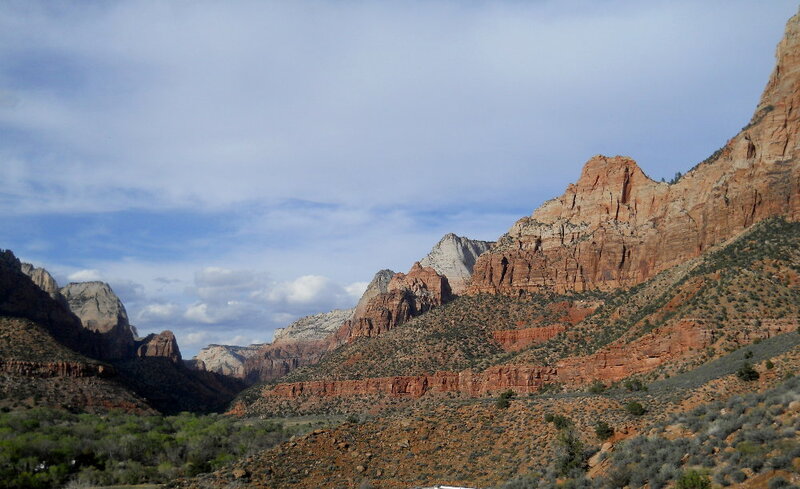 [Sunday] After another good breakfast at the B&B, we drove up UT-9 through Zion Park (through a 1-mile long tunnel through the mountain) and on to US-89 north. 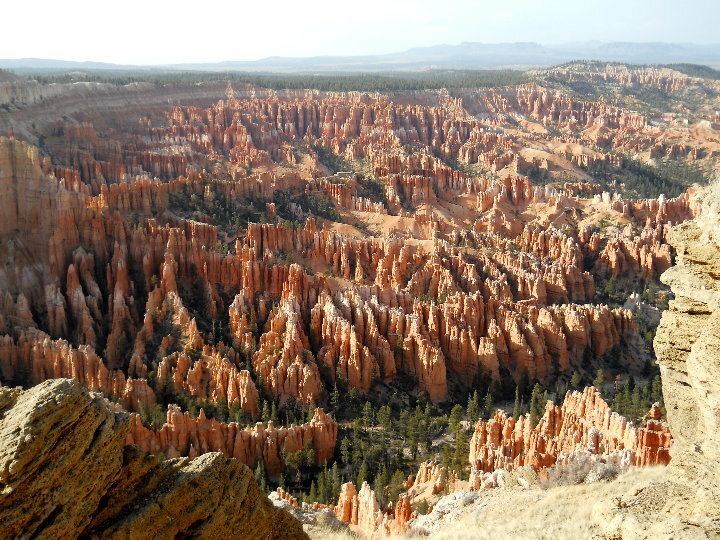 We then took UT-12 to Bryce Canyon National Park. 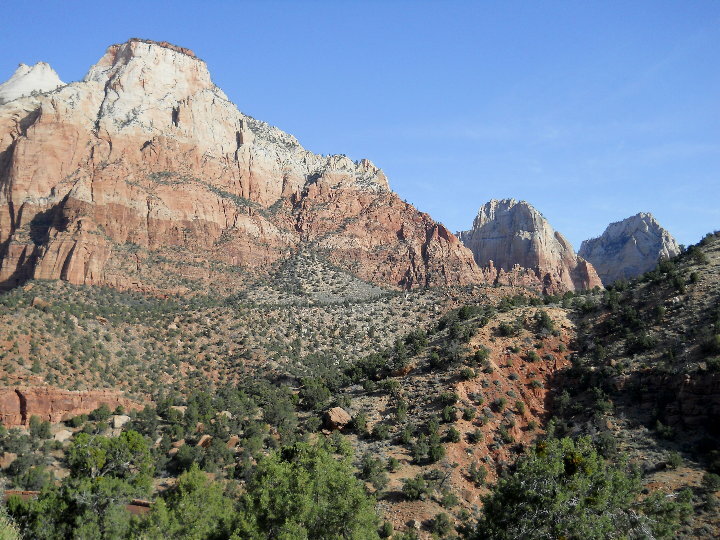 We went to the Visitor Center and watched a movie, then drove to Sunset Point and hiked the Rim Trail to the Queen's Garden Trail and the Navaho Trails back up to Sunset Point, about a 3-mile loop. We drove all the way to the end of the Scenic Drive making all the stops along the way. After all the hiking and enduring a cold 40 mph wind all day, we stopped at the Bryce Canyon Lodge and enjoyed a hearty meal at the restaurant. 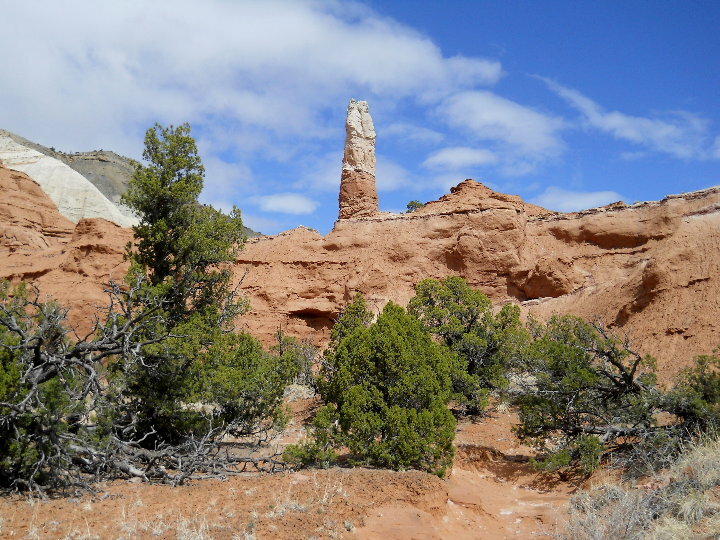 We then drove on UT-12 to Escalante and the Canyons B&B. We stayed in the Garden Room, which was very nice, with a nice deck on the side. Unfortunately it was too cold and windy during our visit to use it. < Canyons Bed & Breakfast. [Monday] This morning we met Cate, the B&B owner, in the dining room. She had a nice breakfast for us and advice on how to best see Capital Reef National Park today. We left town about 10 AM and drove north on UT-12 to Boulder. We stopped there to buy snacks and mail post cards at what was the last post office in the country to receive it's mail via wagon train. The lady at the counter in the Country Store told us that her father and grandfather were the ones that hauled the mail. It began to snow lightly as we left Bolder for Torrey. We drove over Boulder Mountain and it was snowing and about freezing temperature at the 9600 foot summit. 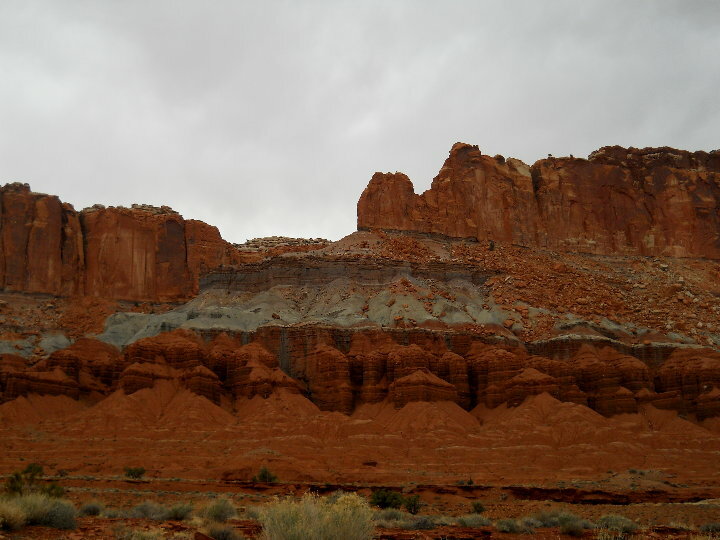 As we got into Torrey, the closest town to Capital Reef, it had stopped raining/snowing. 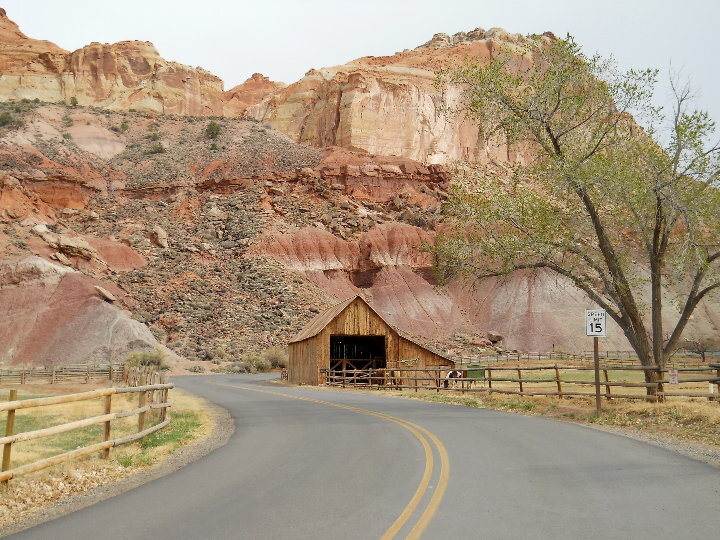 We drove on UT-24 through Capital Reef NP to the other side (a beautiful drive). We turned around and drove back through heavy rain to the Visitors Center. It had stopped raining at the Visitors Center. We watched a movie and got instructions on the scenic drive. We drove all the way to the end of the paved road and then to the end of the dirt Capitol Gorge Rd. We hiked down the trail that goes down a dry wash, Capital Gorge Trail. We drove back north on the scenic drive and to the end of Grand Wash Road and hiked down the Grand Wash Trail for a little ways. On the way out we stopped at the Gifford House Museum. The Gifford Homestead was built in 1908 by Mormon polygamist Calvin Pendleton. We bought a blackberry pie to take home and ate some homemade ice cream there. We drove to Torrey and drove around the small town. We at supper at a Subway. We started back down UT-12 in a moderate snow shower. 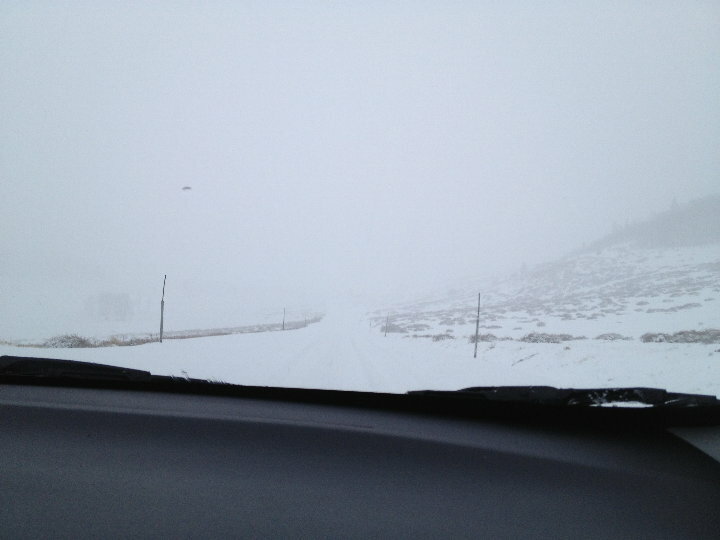 The further we got on Boulder Mountain, the worse the snow accumulation and the road conditions. It finally got really bad driving the small rental car in the snow ruts up and down the steep road. We got loss of traction warnings from the car many times and almost lost control of the car one time. It was not something we Texans were accustomed to driving in! After we had passed the summit, on the way down we met a snow plow on the way up plowing the road. What a beautiful sight! 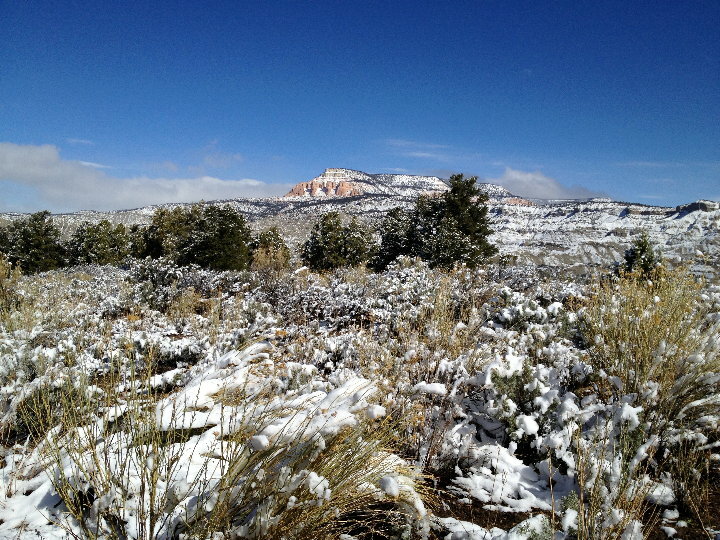 The heavy snow lasted on past Boulder, but thankfully we made it to Escalante again. 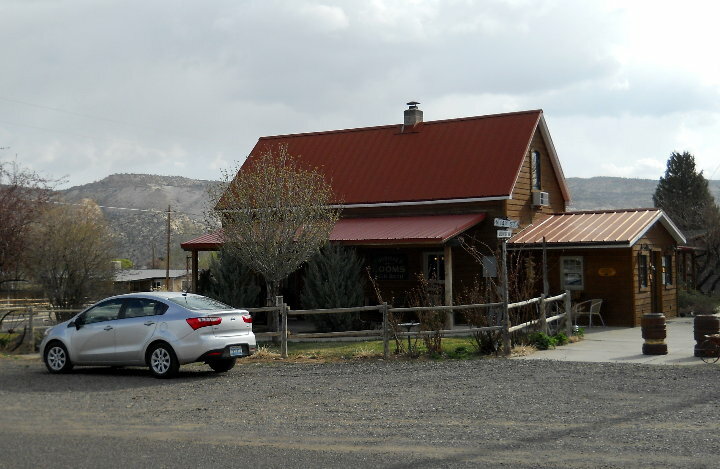 We met the other couple that were staying at the Canyons B&B in the dining room that evening as we enjoyed a hot tea and some of our blackberry pie. 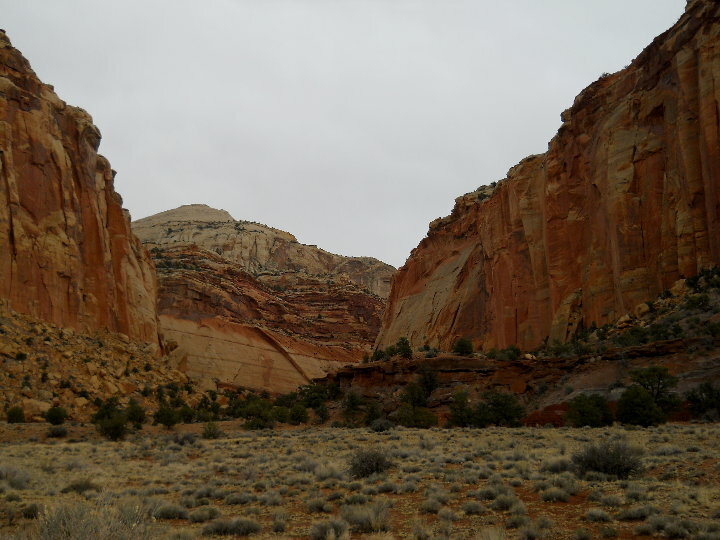 < < < Capital Reef National Park. < Boulder Mountain road. 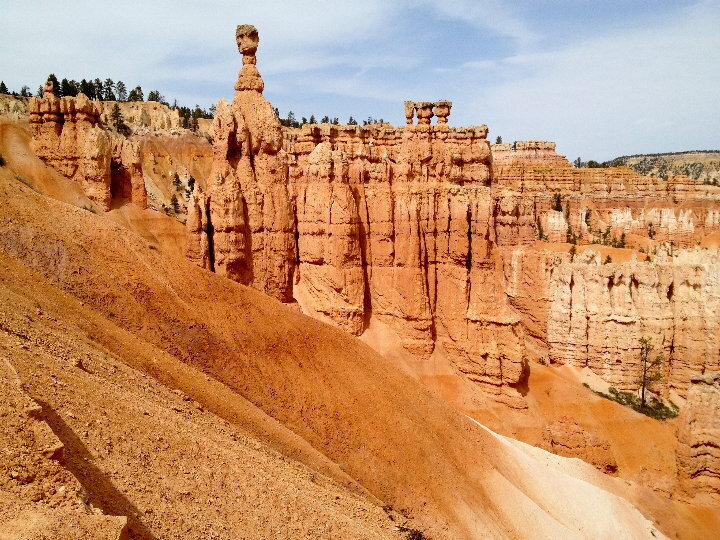 [Tuesday] After breakfast at Canyons B&B, we drove west on UT-12 to Kodachrome Basin State Park. We hiked the Grand Parade Trail and the Nature Trail, then ate our lunch in the car. This being the day after the snow storm came through, the wind was blowing about 40-50 miles per hour and the temperature was cold. 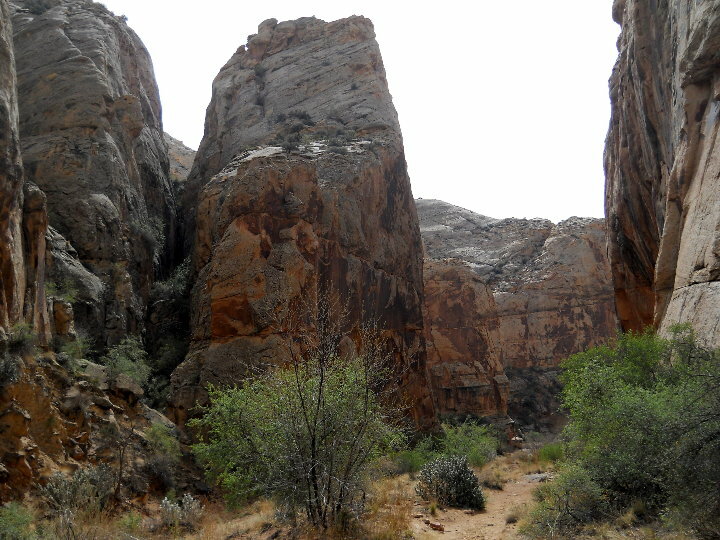 At the end of the Grand Parade Trail, where we were in a tight canyon, the wind was blowing sand and small rocks off the side, making it very uncomfortable. 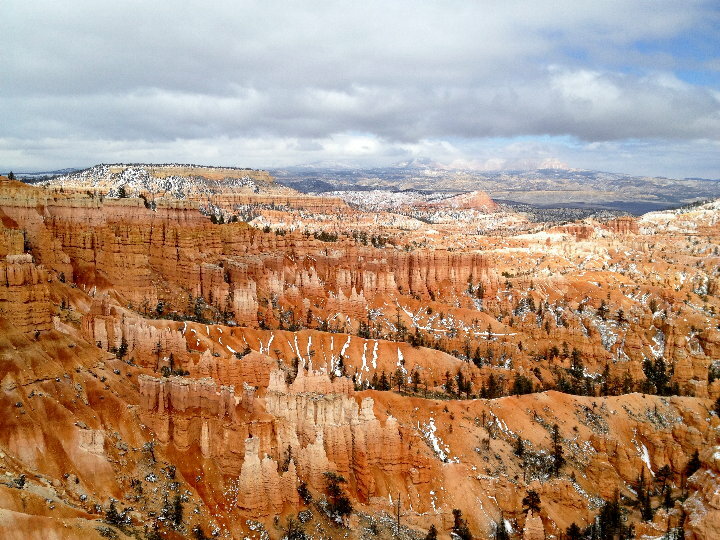 In the afternoon we drove back to Bryce Canyon NP to see the park after the snow storm came through the day before. 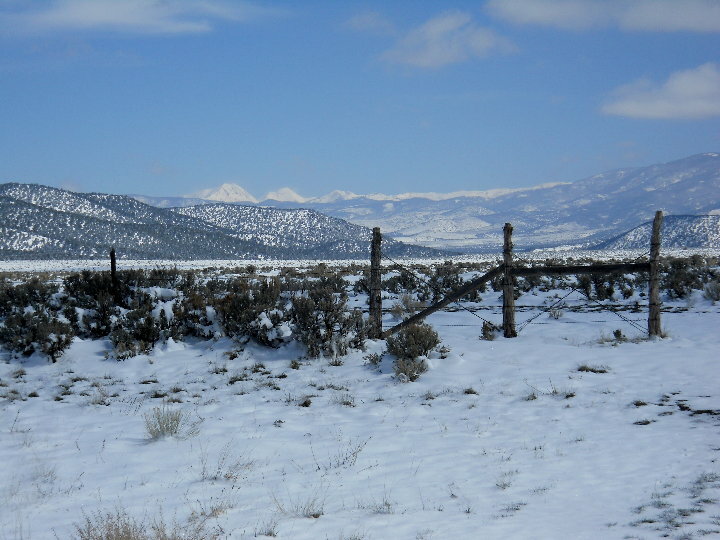 The park scenic drive was closed after Bryce Point due to snow. < < Kodachrome Basin State Park. 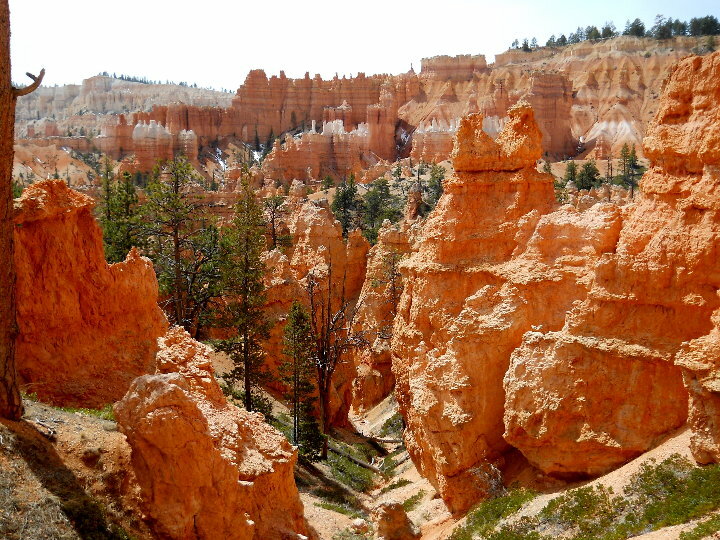 < Bryce Canyon National Park after the snow storm. 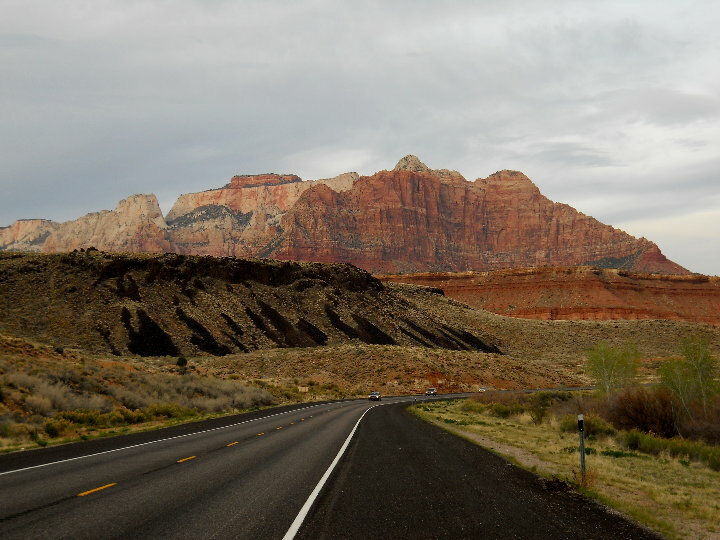 [Wednesday] After breakfast, we drove back to Las Vegas on UT-12, US-89, UT-20 & I-15. There was lots of snow on the tops of all the mountains all the way to Las Vegas. We checked our car in at Budget and caught the United flight #350 back to Houston. We arrived about 15 minutes early in Houston - about 9:45 PM. < < Along UT-12 & UT-15 after the snow. This draws to a close our visit to Southern Utah. We hope you enjoyed the photos and brief descriptions of our activities. God willing, join us again soon for another RV adventure.